Fukuoka has many famous mountains and gorges, and each of them offers great beauty in all seasons. Here are some autumn-leaf viewing spots that you shouldn’t miss if you’re planning to visit Fukuoka during the fall season. Komyozen-ji Temple is located in Dazaifu, at the very end of the approach to the Dazaifu Tenmangu Shrine. Although the temple is also known by the name of “Koke-dera” (temple of moss), it has beautiful autumn leaves and rhododendron flowers. The best autumn-leaf viewing season is from mid to late November. 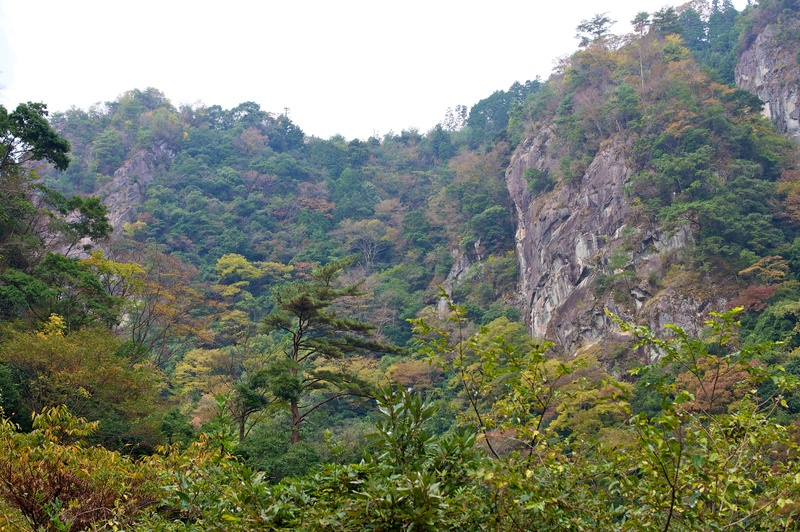 The Hyugami Gorge, or Hyugami-kyo, can be found on the lakeside of the Hyugami Dam on the upstream of Yabe River. This is a mysterious autumn-leaf viewing spot: according to legend, a winged horse once came out from the “Kehogi-iwa”, a huge rock with a big opening. The best autumn-leaf viewing season is at the beginning of November. The Raizan Sennyoji Daihio-in Temple in Itoshima is an old temple found on the midpoint of Mount Raizan. Among the many Buddhist statues that can be found at this temple, Senju Kannon (“1,000-Armed Standing Kannon”) is designated as a national important cultural asset. The foliage on the 400-year-old maple tree is also not to be missed. The best autumn-leaf viewing season is from the end of October to mid-November. 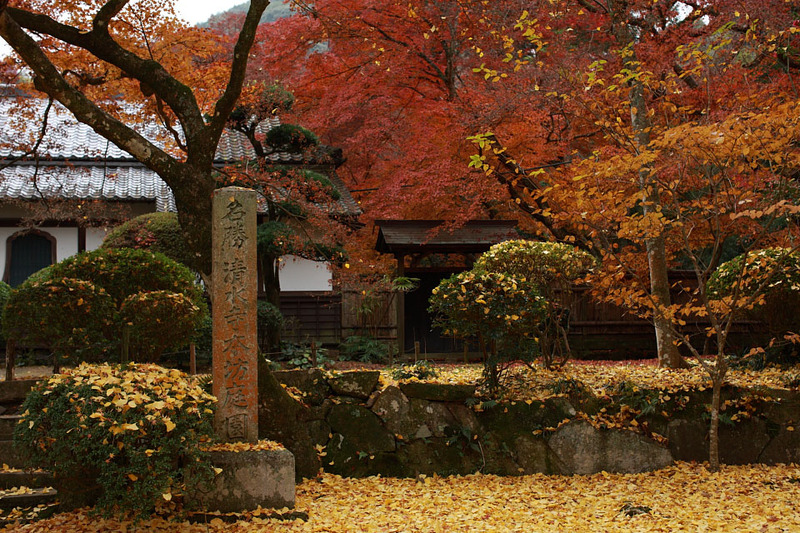 Fujie’s Gyorakuen, a nationally designated scenic garden, offers a beautiful scenery created by the contrast between the green moss-covered rocks and the red autumn leaves. The wax tree road of Yanagisakasone in Kurume is a popular autumn-leaf viewing spot, and features a 1.1 km long avenue of approximately 200 wax trees. 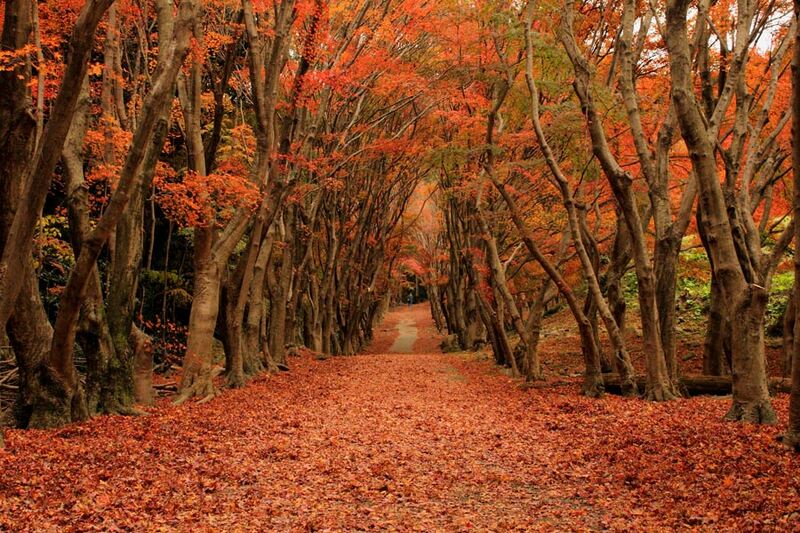 Designated as a natural monument by Fukuoka Prefecture, it is one of the must-see autumn-leaf viewing spots. The best time for autumn-leaf viewing is at the end of November. Mount Inugatake is a rugged mountain, which people used to be afraid of as it was believed to be full of ogres. The entire mountain is covered with Tsukushi shakunage, a type of rhododendron indigenous to this region and a designated national natural monument, in full bloom from spring to early summer. 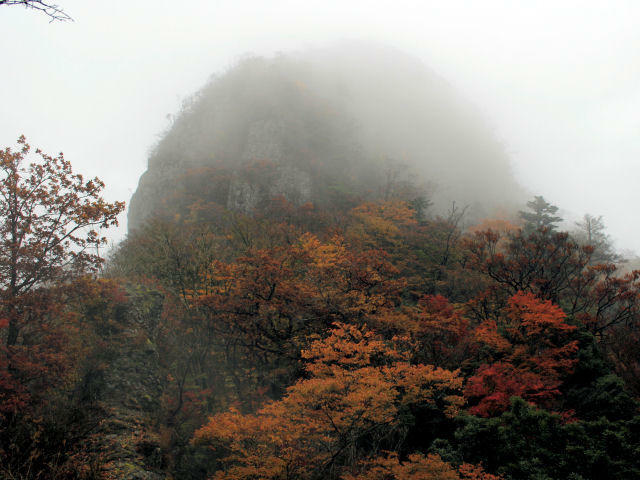 In fall, the mountain gets covered with beautiful autumn leaves from maple trees. The best autumn-leaf viewing season is from mid-October to mid-November. The Kamado Jinja shrine is located on Mount Homanzan, which people have been worshipping as a mountain where gods reside. The autumn leaves are concentrated around the steps leading to the shrine, and the color gradation is very beautiful. The best autumn-leaf viewing season is in mid-November. The Akizuki Castle ruins area in Asakura-shi is a castle town referred to as “small Kyoto in Chikuzen”. There are approximately 20 maple trees around the black gate, and they create a beautiful contrast with the gate on the background when they change color in autumn. This is a very popular shooting spot for photographers. The best autumn-leaf viewing season is in late November. The Kiyomizu-dera Honbo Garden in Miyama-shi is a nationally designated scenic site. The garden offers different landscapes from one season to another, including the beautiful Japanese maple trees in fall. The best time for autumn-leaf viewing is from the end of November to the beginning of December. Mount Hiko in Soeda-machi, Tagawa-gun straddles Fukuoka’s border with Oita. One of the most sacred mountains in Japan, Mount Hiko has been a popular place for ascetic training from the olden times. This spot offers a longer autumn-leaf viewing time since the trees change their color later as the altitude gets lower. The best time for autumn-leaf viewing is from early to mid-November. Fukakura Gorge is located to the southwest of the foot of Mount Shojigatake, which is also considered a hidden retreat of Mount Hiko. 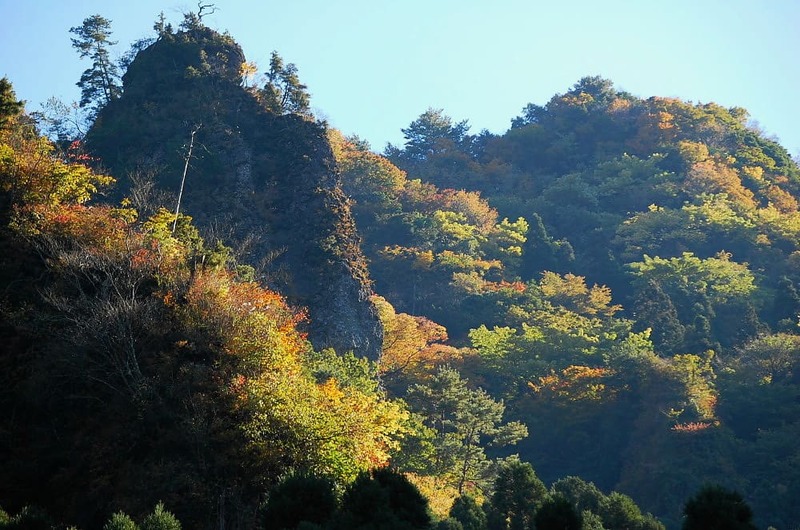 The natural formation with oddly-shaped rocks and gradation of autumn leaves creates a very beautiful landscape. The best autumn-leaf viewing time is from the end of October to the beginning of November. In Shiranoe Botanical Gardens in Kitakyushu, you can enjoy some spectacular maple trees turning red in the autumn. The best autumn-leaf viewing season is from the end of November to the beginning of December. Mount Sangun is located in Umi-machi, Kasuya-gun, and is part of the Dazaifu Prefectural Natural Park, which is a popular destination for hiking. The best autumn-leaf viewing season is from early to mid-November. This large park in Kitakyushu is known for its wisteria tunnel. The garden is only open to the public for the wisteria season in spring and autumn-leaf season in fall. The impressive scenery of 700 maple trees is various shades of orange and red is worth a visit. The best autumn-leaf viewing season is from mid-November to the beginning of December. 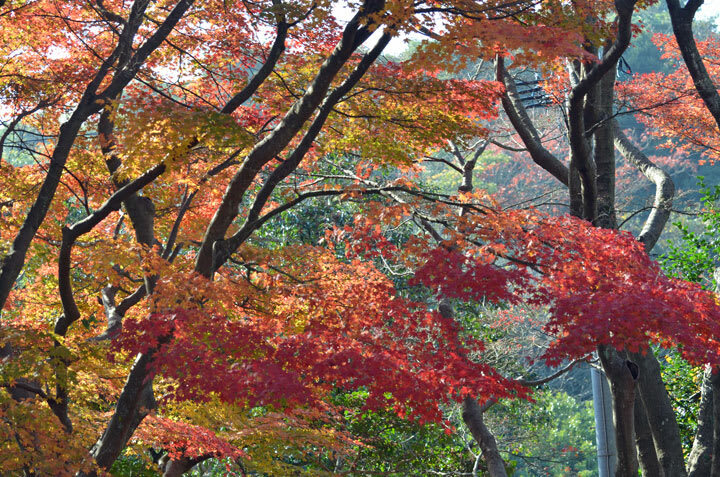 We hope you enjoyed our walkthrough of some of the great autumn-leaf viewing spots in Fukuoka. If you have the chance to visit some of them, please share your impressions on our Facebook page! Some of the Must-see Best Autumn-leaf Viewing Spots in Koshinetsu Area!